BOAT OWNER'S NOTES for 1978 SEA RAY Sedan Bridge in Very Good Condition, call Jake @ 559-846-3908. FEATURES: 2 Mercury Cruiser 4 cylinder motors 480 total hp, Alpha one outdrive, trim tabs, Sedan Bridge, 1 VHF Radio, 1 HDS7 Lowrance fish finder, Sirius radio capabilities,Head, Alcohol stove, Refrigerator, Porta Potty, Windlass anchor, Bimini top over deck and fly bridge, Boat can easily reach speeds of 28-29mph, Stainless Steel props, Dual Axle Trailer 2 years old with oil bearings (was $7,000 when purchased new), Full Gauges, 4 Batteries with trickle charger, Swim Platform, Professionally Maintained. 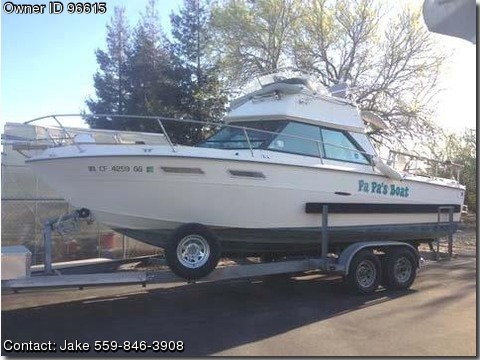 If you have any questions about my boat please feel free to call me @ 559-846-3908.